I still seem to have the plague, but the Boston Fashion Week Sip & Swap was a full week ago, and it's time I get some pictures up, sick or not! Last Thursday's swap was the first official Boston Fashion Week event to be organized by Amy Chase of PunkyStyle and Haberdash Vintage and Melissa Massello of Shoestring. Collectively, these lovely ladies are known as the Swapaholics, and they've been gaining notoriety nationwide for their swapping savvy. In fact, Nightline was on the scene at last week's swap to film it all! The evening began with a blogger meet-up in the loft of the Somerville Armory. After dropping off our bags of unwanted clothes, we sampled wine and perused a rack of (free!) clothing that local resale boutique The Closet was kind enough to donate. Meanwhile, the Swapaholics and their crew organized the gently-used clothing downstairs as hundreds of swappers began to line up outside. The doors opened to the crowd at 8 p.m., and the racks were emptied by 8:15. The protocol was simple: grab what you want. As far as I know, no one was trampled in the process. I managed to avoid any flying elbows, but I must admit, I was a total failure! I walked away without a single item. I was in too much of a daze watching the madness and scanning the racks for something perfect. I've learned my lesson for next time: grab now, think later. The blogger fashion show after the swap completely made up for my lack of swapping success, though. Sure, I was a bit jealous of the girls that got the leopard-print cardigan and the perfectly ridiculous prom dress, but it was a blast helping other bloggers style newly swapped outfits for the runway. Once again, Boston girls have proven to me that this town is about more than khakis and argyle. Give us a closet full of discards, and we'll create a masterpiece! 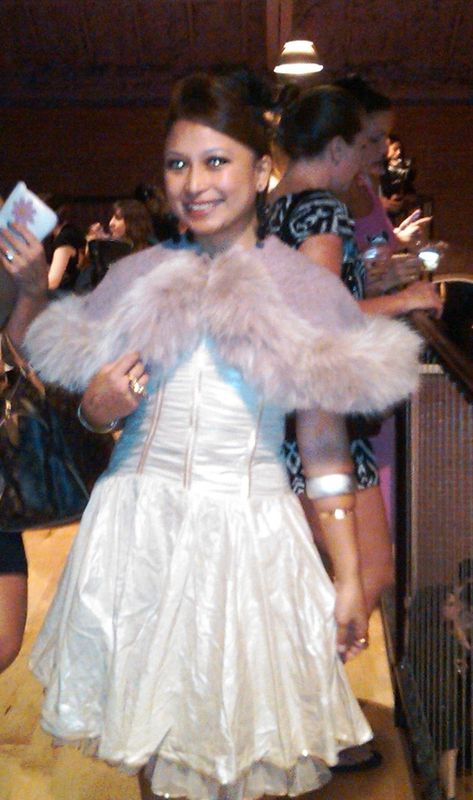 Najeema of A Stylized Hysteria agreed to model this creepy stole that I found. My camera battery died, and I had to resort to the crackberry, but I couldn't resist posting this photo of Lei Ann of Give Me Platforms in the amazing new outfit she put together at the swap. i am sorry to read that you didn't find a single thing!!! did your cousin? maybe she could share? Swap shops always sound brilliant because you think you're going to find something! Darn the camera battery... and that stole is definitely a little on the creepy side... but for lol factor that film with Jim Carey just popped in my head - Ace Ventura!!! Ugh that sounds like so much fun!! Wish i could venture to one of these!! Sami, my cousin made out like a bandit, and I've already told her she's sharing with me! Monique, they're all over the country! Check out the website. What's up with this plague that's going around? Why didn't anyone warn me it was coming?! Sorry to hear you're feeling crappy! Post fashion week sickness. I'm actually starting to feel that ominous tingle in my throat, but I'm hoping it holds off until Monday so I can enjoy the weekend. It was great getting to hang out and chat with you and Abby at the swap, we should 100% get together again soon (well, once you're feeling better). Feel free to email me anytime and we can plan something. So cute, she did a great job!